I hope my readers and friends are enjoying their summer vacation. Vacation means travelling, fun and frolic. Relatives visiting us or we visiting them. Travelling to hill stations to beat the heat..Yes, in all the fun and frolic we need to beat the heat as the temperatures are soaring high and to keep the body cool we tend to indulge in cold water, cool drinks and ice creams and that’s the reason I decided that this month’s theme will be.. 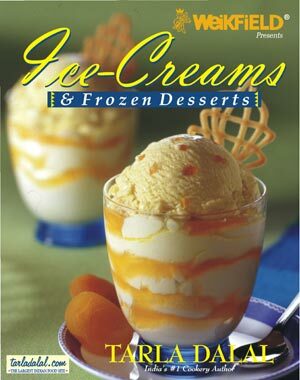 This month is my blog’s 4th birthday and so the giveaway sponsored by www.tarladalal.com is a big cookbook Ice Creams & Frozen Desserts. It’s a perfect book for this climate to treat family and friends. The giveaway is shipped only in India and is open only for the followers of this blog. Any number of entries can be sent but only two recipes from archives will be accepted. Eggless and egg desserts both will be accepted. New and old posts should be linked with the event announcement. The entry will not be accepted in the case of failure of following this rule. Link your entries using the Inlinkz tools. Those participating in giveaway (anyone who can provide an address in India) enter under ‘Indian entries’ category else link under ‘Other Countries’. In case you have a difficulty in using Inlinkz tool, mail me to cookingoodfood@gmail.com. If you like my blog and enjoy reading my posts and recipes, would appreciate that you like my FB page here. Also, participate in COOK LIKE MOM, hosted here and Win Raghavan Iyer’s 660 Curries which will be shipped across borders. hi, by mistake I added my name in the place of the recipe name...can you pls edit it to "Lemon Raspberry Cupcake"? Hi Pari, Linked one entry. I have another recipe that I will be posting this week. Will link that one too. Hi Pari,linked another dish today. Have linked my salted mint lassi to "ONLY" event and linked back your event in my page as awell. Linked my watermelon popsicles to this lovely event..Happy hosting..